Tokyo, September 26, 2014 – Fuji Heavy Industries Ltd. (FHI), the manufacturer of Subaru automobiles, will debut an upgraded Subaru Impreza on the US market later this year as part of its 2015 model lineup. This will be the first Impreza with Subaru's proprietary "EyeSight" Driver Assist Technology, further adding to the US models with this technology. The 2015 Impreza delivers enhancements in safety performance that the driving public now demands. As the first Impreza with the new EyeSight*1 system, it achieves a huge leap in preventative safety. 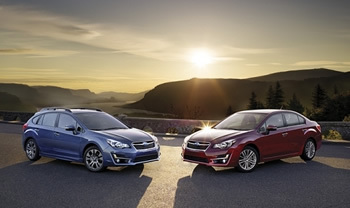 Design enhancements give the new Impreza a sportier front face while cosmetic additions to the interior reinforce its expressions of sportiness and quality. Furthermore, optimal suspension tuning and other tweaks couple enhanced riding comfort with a quieter interior. To boost fuel efficiency, Subaru has gone all out to minimize internal engine friction without affecting the acclaimed driving performance of the Symmetrical AWD (All-Wheel Drive) system with the Boxer engine at its core. This effort has yielded a level of fuel economy*2 that places the Impreza at the top among AWD passenger cars on the US market. As well as the addition of advanced safety features, refinements have been made to the Impreza's value as a car that blends a stylish exterior with a high-quality interior, delivers pleasant and agile drivability and boasts an environmental friendliness with strong fuel economy. Together, these enhancements effectively reinforce the Impreza's overall performance. *1: "EyeSight (ver.3)" as it is known on the Japanese market. *2: For the 2.0i (AWD) model, Subaru estimates highway fuel economy of 37 miles per gallon. The upgraded front face of the Impreza integrates a new grille, bumper, headlamps and fog light covers that accent the Subaru identity and yield a sportier appearance. The side mirrors have a new shape that not only looks smarter but also reduces forward blind spots and enhances slanted forward visibility. On the sedan model, the integration of a spoiler into the rear edge of the trunk enhances the Impreza's sporty appearance and aerodynamic performance. Crystal White Pearl has been added to the choice of exterior colors. The quality feel has been refined with the extensive use of metallic accents and piano-black panels. The interior tone of quality is highlighted with silver stitching on seats, armrests and other upholstery components that car occupants are likely to touch more often. The new Impreza employs a boot-type shift lever. The upper-grade speedometer incorporates a 3.5-inch full-color LCD multi-information display that adds to the functionality and advanced design of the instrument panel. The center console integrates a wide, flat navigation and audio center display*4 with intuitive touch controls. A new-generation interface design assures a higher level of readability and user friendliness with easier enjoyment of connectivity with a wide range of media sources including navigation and audio systems. A quicker steering-gear ratio delivers nimbler handling. Optimized suspension damping performance assures a flatter, more comfortable ride. The increased use of sound-absorbing materials on various components of the car body helps control vibrations and noise and guarantees a quieter cabin experience. Steps to reduce friction caused by internal engine components have helped place the Impreza at the top in terms of fuel economy for AWD passenger cars on the US market. Stiffer, redesigned transmission components and a wider gear ratio deliver improved environmental friendliness and drivability. The D range of the transmission has been configured to utilize a continuously variable shifting mode under light acceleration and change to a stepped shifting mode under heavy acceleration. The 2015 model is the first US-spec Impreza to be equipped with Subaru's proprietary "EyeSight" Driver Assist Technology. The new version of EyeSight*5 represents an evolutionary leap in preventative safety and driver load-reduction features such as Pre-Collision Braking Control and Adaptive Cruise Control. Compared to the previous system, it employs an entirely new stereo camera system with an approximately 40 percent increase in viewing angle and distance. Nighttime cornering visibility has been enhanced with Steering Responsive Fog Lights (SRF)*6 that automatically illuminate on one side when cornering. In consideration of oncoming vehicles, the SRF system is capable of automatically illuminating and dimming the fog lights in response to steering angle and car speed. Safety when backing in reverse has been improved with the use of a superwide-angle rearview camera that provides a wider viewing area behind the vehicle. *6: Standard equipment on EyeSight-equipped models.